Valuations are required for your insurance policies. Most insurance brokers request a current valuation; so as the price of gemstones and precious metals vary over time you may be required to update your valuations to ensure that your jewellery is fully covered. At Le Grand Amour we offer a convenient and confidential service for all your valuations. Our on site gemmologist and valuer will be delighted to assist you. The valuation includes a photograph and a detailed description of the item, which is accepted by all insurance companies worldwide. 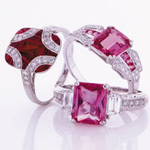 Le Grand Amour provides a complimentary valuation with all purchases made over $500. All prices are quoted in Australian dollars and are inclusive of GST.